Jean Rousseau (1606-84) was the son of a watchmaker and the father and grandfather of watchmakers. He was the great-grandfather of Jean-Jacques Rousseau, the philospher (1712-78). The latter said that a Genevan watchmaker 'is a man who can be introduced anywhere; a Parisian watchmaker is fit only to talk about watches' (quoted in Wikipedia entry on J.-J. Rousseau, 26.10.2010). 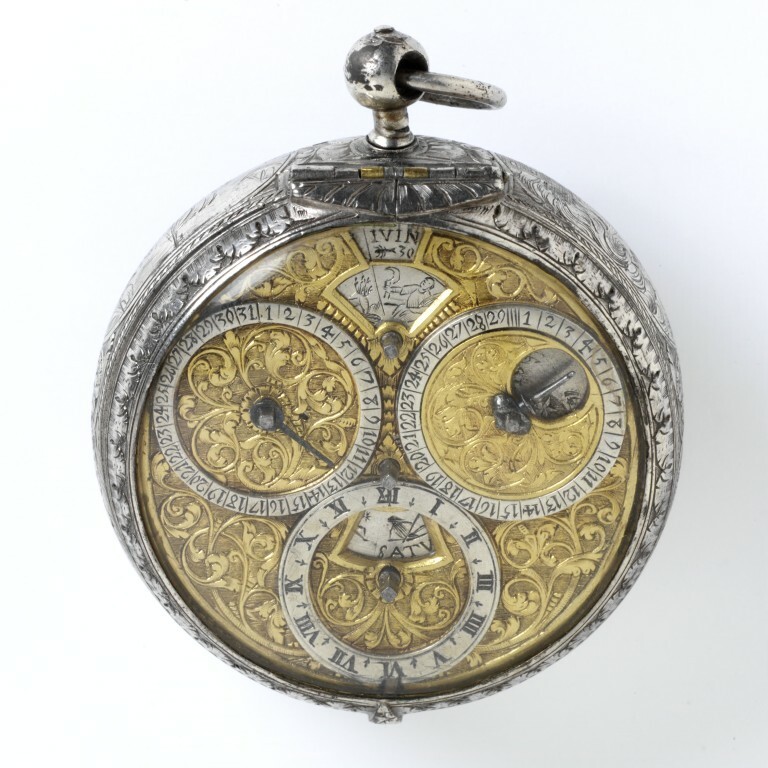 Watch in silver case engraved on the reverse with oval vignettes of the Four Seasons within scrolling foliage. Around the band are vignettes representing the Four Elements: Earth, Air, Fire and Water. Gilt brass dial with subsidiary dials with silver rings and silver apertures. The top aperture shows the name of the month, the number of days in the month, and the zodian symbol. The left dial shows the date. The right dial shows the age and the phase of the moon. The bottom dial shows the time in hours I-XII with aperture for days of the week. The top plate of the movement is engraved 'Jean Rousseau'. Bought from the auction of the Bernal Collection, 1855.